I received an email from the son of the late Alberto de Oliveira (a Portuguese) who as a hobby built model cars from scratch. Please visit http://alberto-de-oliveira.blogspot.no to see the builder’s pages. The pictures of these models moved me, so I wanted to make this small blog page in support of the blog. Also: the models are for sale (see comment below). 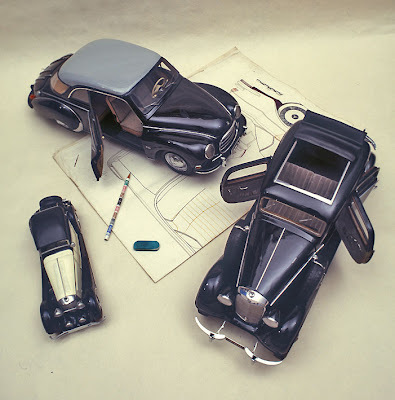 My father spent all his life building scale models of car; mainly Mercedes Benz! He was a teacher and owner of three schools but all the free time was used on this hobby. All models are integrally made by himself in wood, brass, prespex, etc. He passed away in 2011 and I can´t keep all of his models because they are too big and too many to present properly in my house; I only want to keep three with me! I am selling the rest of his collection that consists of the scale models (scratch built), blueprints, catalogs, photos, etc.